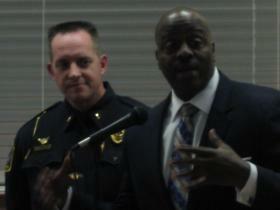 Ypsilanti Police Lieutenant Paul DeRidder, left, and Washtenaw County Sheriff Jerry Clayton present a plan to Ypsilanti City Council to move dispatching to the county. Council will likely take up the matter later this month. Dec. 2, 2009 · 10:21 a.m.
Ypsilanti City Council will likely be discussing the merits of contracting dispatch for police and fire departments through the Washtenaw County Sheriff’s Office. After a presentation during the Tuesday night City Council meeting, City Manager Ed Koryzno said the group would likely be taking the matter up for discussion during its meeting later this month. He said the matter can be decided by resolution of Council, which would not require publication or a public hearing. During his presentation to City Council, Lieutenant Paul DeRidder – acting chief for the Ypsilanti Police Department, said the city could realize more than $89,000 in cost savings if the plan is approved. The savings come after shedding nearly $160,000 in operational costs for the city to run its own dispatch, but after losing $70,000 in special revenue the city receives from the state to operate its dispatch center. The plan with the sheriff allows dispatchers working in Ypsilanti to move to the sheriff’s office in a lateral transfer. DeRidder said the dispatchers would all see a raise in salary and have benefits that are equal or higher than what the city provides for them. The city currently employs four full-time dispatchers who answer calls and dispatch for both the YPD and the Ypsilanti Fire Department. Each department respectively supplies the salaries of two dispatchers. Working at the county level, he said the city’s dispatchers would work with the nine currently employed with the sheriff. He said there is upward mobility at the county for the city’s dispatchers, who have no where else to go up the ladder. “It would be more of a team atmosphere,” DeRidder said. Though the dispatchers will be able to maintain equal or higher pay and benefits, DeRidder said they will lose their seniority in the transfer. However, he said the sheriff plans to hire more dispatchers after the city’s are transferred, which means they would be on the bottom. In the plan, the sheriff’s office will provide dispatch service to the city of Ypsilanti at a cost of $73,000 a year for four years. The cost can not change more than 5 percent in either direction in its fifth year. Calls for fires or rescue, which would require response from the Ypsilanti Fire Department, would be routed from the sheriff’s office to Huron Valley Ambulance, which would then send out fire fighters and first responders. The city would contract HVA services for more than $36,500 a year for two years, with the cost unable to change more than 5 percent in either direction in the third year. The YPD would still handle calls that came through on the department’s local non-emergency line. Normally answered by dispatchers, DeRidder said other office staff – officers included – would take over those responsibilities. However, officers currently fill in for dispatchers when they are on break or lunch, and this would no longer become an issue at the department. After the YPD lobby closes, the button by the front door will still be active. However, the call will be answered by the sheriff’s office. Both DeRidder and Sheriff Jerry Clayton said moving dispatch to the county will not have an impact on response times. Clayton even pointed to language in the memorandum of understanding that said the WCSO guarantees the quality, timeliness and customer service as any call handled at the county level. However, nine audience members spoke out against the move at the meeting. Most sited a prediction of longer response times, some pointed to other areas they thought savings could be made. Others questioned how the entire process took place, stating YPD Lt. Amy Walker wasn’t made part of the process. “If you add another step in the process it does cause a longer response time,” said Ypsilanti resident Sheranda King. One point brought up repeatedly is that the city is currently looking to replace Matthew Harshberger, who left his position as YPD chief in May to take a similar position in Pittsfield Township. Several members of the audience suggested City Council wait until a new chief is chosen before making a decision. After the meeting, however, Koryzno said the city has to act within quick time frame in order to secure the four positions at the WSCO for city dispatchers. While there is no specific deadline, he said the sheriff is looking to fill its vacant positions in a timely manner and is currently holding on the matter to wait for a decision from the city.